Be part of a cohesive team - and give your organization the ultimate competitive advantage. In theory, teamwork is simple. Most of us already know what it requires. But in practice, teamwork is difficult. Building a team is a process, one that requires remarkable levels of discipline, courage, and persistence. Based on the best-selling leadership fable "The Five Dysfunctions of a Team", the new edition of this easy-to-use workbook provides participants with an opportunity to explore and overcome the pitfalls that side-track teams. Beginning with a 38-item team assessment, the workbook guides participants through the five steps of developing a cohesive and productive team: Building Trust; Mastering Conflict; Achieving Commitment; Embracing Accountability; and, Focusing on Results. Ideal for off-sites and retreats or even a series of development meetings, this workbook is an excellent team development tool. 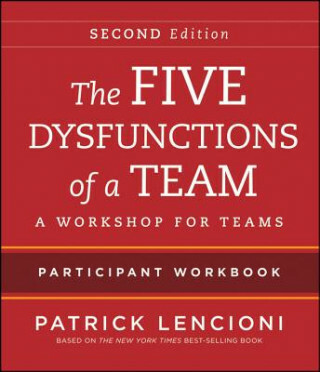 ""The Five Dysfunctions of a Team" is simply the best content available on teams. After implementing the products extensively within our organization, we have found Lencioni's practical approach to be invaluable". (Mike Phelan, principal, Deloitte Consulting). "Lencioni's approach to team development is refreshing - practical, extremely engaging, and not touchy-feely. I would recommend this experience to any team wanting to excel". (Vern L. Toland, managing director, Hilton Grand Vacations Company). "The Five Dysfunctions of a Team program not only restored the fiscal health of our company, it provided the crucial tools for us to face the economic downturn. The program has enabled us to sustain performance through creativity and teamwork and we're using it throughout our entire company". (Matt Danilowicz, CEO, Clear-Com).